You know, bleach is quite a cheap product, coming in at just a few bucks a gallon (or less if you find a generic brand). And while most people use it for cleaning and disinfecting, it’s actually way more versatile than you think. In fact, as the first item in the list will show you, when you use your imagination, bleach can be an amazing product. This is by far my favorite alternative use for bleach. I don’t know about you, but I have always been extremely cautious around bleach, and I try and wear white t-shirts and old jeans when using it. Sometimes, I have forgotten, and the splashes of bleach can quickly ruin your favorite clothes. But why not turn that negative into a positive, and use bleach to create stunning t-shirt designs of your own at a fraction of the cost you’d pay in stores? 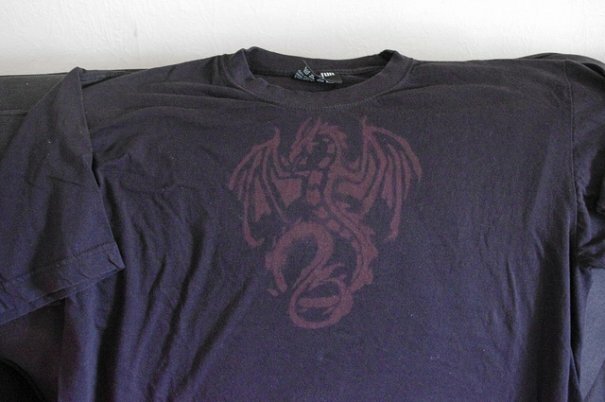 All you need are some black (or dark colored) t-shirts, some bleach or a bleach pen, a toothbrush, a spray bottle, and a stencil of your own design. I have a stencil ready for my Batman shirt, and it is going to look killer. And why stop at t-shirts? Regular shirts, jackets, pants — they could all be treated this way. But if you need some inspiration, check out the designs at this subreddit called bleachshirts. This is a craze I really hope catches on. I was wary of this one, but I’ve found the advice everywhere on the web, including eHow, Earthclinic, and Wikihow. Add about two tablespoons of bleach to a gallon of warm water, and soak your stinky feet in it for about 5-10 minutes a day for a week. That should get rid of the nasty odors. If it dries your feet out, apply baby oil to your feet after you’ve rinsed and dried them. Bleach is not just good at bringing your white clothing back to life. You can also restore newer porcelain items (NOT antiques; you could seriously diminish their value). Simply soak paper towels in undiluted bleach, and wrap them around the porcelain item for around 20-30 minutes. Then, rinse in cold water and dry off. Your porcelain should look like new. However, don't try this on a colored porcelain — you will ruin it. Stay with white only. It’s hard to believe that something as toxic as bleach could help a living thing thrive, but it can. Well, flowers (once cut) are technically no longer living, so maybe that’s why. Just add ¼ teaspoon of bleach to each quart of water you put in the vase. If you have some weeds poking through the patio concrete, your driveway, or your sidewalk, a little undiluted bleach will kill them. Put it in a spray bottle, and fire away. Sometimes, in just minutes, you’ll see the offending weeds turn black and die before your very eyes. HOWEVER, it can also do the same to grass, so do not use this on your lawns! Only use bleach on weeds where you are confident you want nothing else to grow. After a while, a funky smell can start emanating from the garbage disposal or “insinkerator” in your kitchen. They do sell products that promise to freshen it up, but why fork out extra money when you have a solution ready to use right under the sink? Pour a few capfuls down the sink and let it sit for at least a few minutes — more if possible. The bleach will kill the bacteria, and the smells will be gone. While you’re at the sink, soak your sponges in a mixture of ¾ cup of bleach with a gallon of hot water. Ensure a thorough rinsing before you use them again. If you have kids, you probably have plastic furniture somewhere in the house. And it will be dirty. 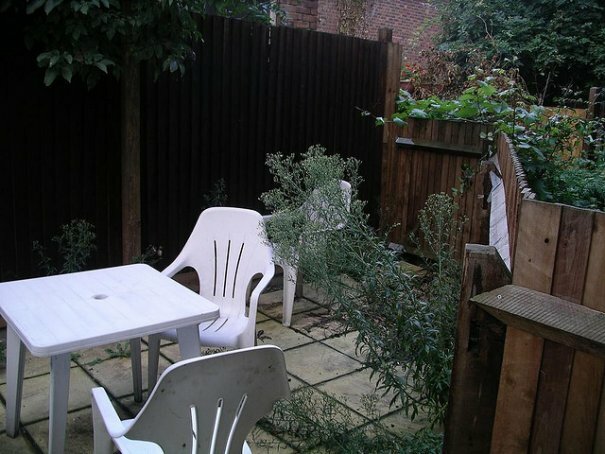 You may also have plastic garden furniture looking well past its prime. Take 1 gallon of hot water, add ½ cup of bleach, and clean it with a cloth or sponge. You should see the revival take place before your very eyes. Then, rinse with clean water several times before letting the kids come back and wreck it again! If your glasses and glass dishes are starting to look a bit cloudy, bleach can help you restore their sparkle and shine. Just add a teaspoon of bleach to hot soapy water and wash them in it, followed by a buffing with a dry kitchen towel. If boiling is not possible, treat water by adding liquid household bleach, such as Clorox or Purex. 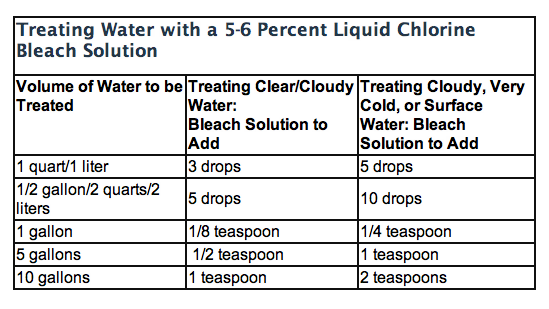 Household bleach is typically between 5% and 6% chlorine. Avoid using bleaches that contain perfumes, dyes and other additives. Be sure to read the label. Place the water (filtered, if necessary) in a clean container. Add the amount of bleach according to the table below. Mix thoroughly and allow to stand for at least 30 minutes before using (60 minutes if the water is cloudy or very cold). Do you have any other cool and unusual uses for bleach? Let us know. The article was insightful. Especially the 6th point. I should try bleach on my sponges to keep them fresh. We like to add a couple teaspoons to the dishwasher every other wash, or less. Keeps the plastic liner looking just great. Absolutely love #6, we go through so many sponges at my house with five kids. Just gave it a go with a nasty sponge I was about to throw out - it's definitely not good as new but it'll last another week or so at minimum! Every dollar counts. Great article. I included it on Tuesday's Frugal News Review podcast. I particularly enjoyed weed killer and plastic chair restoration. The suggestion above is a good one. (Add bleach to soapy dishwater to clean glassware) but be sure NOT to add bleach to your dishwater if you are using DAWN dish detergent. It WILL create a dangerous gas causing burns in the lungs. Actually had this happen to me. Be very careful bleach and dawn mixed can make you very sick. I'm astounded, I cannot believe what I've just read, that you are advocating the wide spread use of chlorine based bleach! Don't you realise that bleach poses a significant risk to the environment.In many more enlightened countries chlorine bleach has been banned. When it reaches water, it reacts with other minerals and elements to form a host of dangerous toxins. These toxins, including dioxins are referred to as persistant organic pollutants because they linger in the water and soil and take many years to disappear. Studies by the West Virginia University Extensions, also links chlorine based compounds with low sperm counts, testicular and breast cancer due to their ability to mimic human hormones. All the above can be achieved without using chlorine based bleach, just a little more thought. Using bleach is just lazyness and complete disregard for our earth. Love it. That graphic in the 9th point is especially handy, thanks.